One of a kind necklace. Beautifully detailed dragonfly curves her tail around a stunning Swarovski, Sapphire Blue crystal. 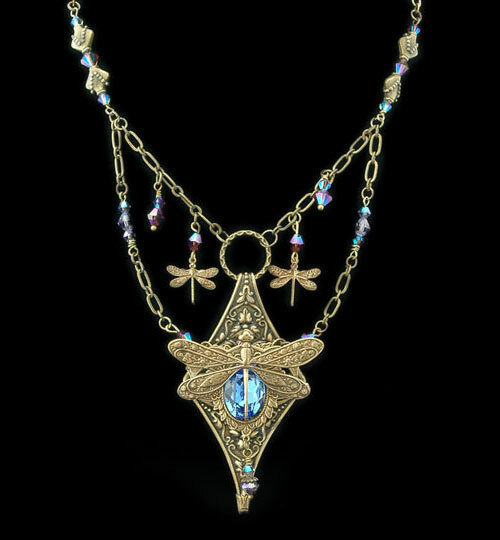 Beneath her lovely wings sits layers of antiqued brass stampings and a tiny drop of Violet and AB violet Swarovski crystal beads. Her two tiny baby dragonflies delicately sway above her in the breeze. The antiqued brass chain is embellished with Swarovski AB Violet and Tanzanite crystals and tiny vase shaped antiqued brass beads.